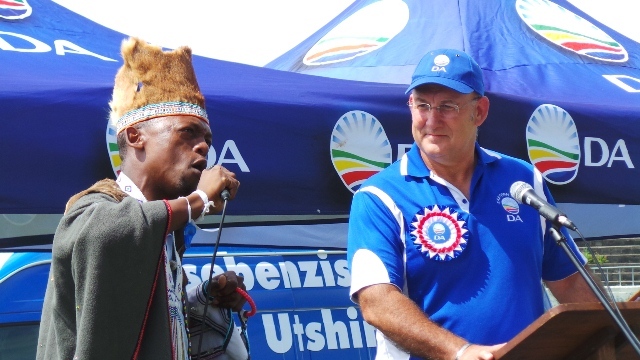 Praise singer Andile Gqitami with Athol Trollip, DA Leader in the Eastern Cape and candidate for Premier in the province at the Sisa Dukashe stadium in Mdantsane recently. LEADERS from the top opposition parties are in town today for the latest Daily Dispatch dialogue. The Great Election Debate at the Abbotsford Christian Centre will see the DA’s provincial leader Athol Trollip (in for party leader Helen Zille), UDM president Bantu Holomisa, EFF’s Gauteng premier candidate Dali Mpofu and Agang president Mamphela Ramphele square off on a public platform less than a month before the elections. Daily Dispatch marketing manager Suren Packery said the dialogues had received an overwhelming response from the public. “We’ve had top leaders in town for dialogues before but this is the first time we’ve had representatives from four parties under one roof,” said Packery. “More than 1 000 people have called to reserve their seats and we have already started handing out the entrance wrist bands. “We urge those who have already booked to collect them from the Daily Dispatch offices,” he said. Packery said people should expect to be searched and that only those with the wristbands would be given entry to the venue.